The job market has so many resume styles that you can choose from, making it even harder to know where to start when you are creating your own. However, once you’ve had a grasp about the different types of resumes out there and when to use them, picking the one ideal for your situation is easy. Since your resume is the first communication with a potential employer, it needs to stand out. But how exactly do you get the right attention? Plus, how do you ensure that your resume grabs the recruiter’s attention? To help you, here is an essential guide to traditional and creative resume styles, and the how and when to use them. Traditional resumes follow long tried and accepted standards of writing resumes. Such resumes don’t have fancy formats nor do they include technology for impressing potential employers. With the traditional template, your resume fits well in conservative industries like finance or family medicine jobs. However, traditional resumes have an obvious drawback; yours will probably look like many others that pass through a recruiter’s hands. This means that your information and experience should speak for itself. On the other hand, a traditional resume is safe since it won’t annoy a recruiter. In addition, your resume looks like it should, and potential employers will be blown away by the facts, and only the facts. However, make sure your resume is clean and concise. Also, embrace brevity while describing your achievements and skills, and don’t use five sentences where you can use one. You can use this resume format if you think an employer is likely to value the more traditional style. Fortunately, you can employ various traditional resume styles. This is a great option on several occasions like when you have limited work experience or applying for a part-time or entry-level job. 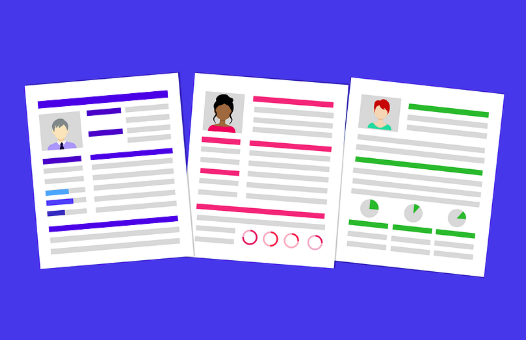 Most employers ask for a one-page resume in job descriptions; so read the prospective employer’s resume guidelines carefully so you give them what they want. Plus, most busy recruiting managers don’t want to read pages and pages of information. The simple resume utilizes a minimalistic, clean style to catch a potential employer’s eye. If fancy formats are not adding anything special to your resume, it’s best to avoid them. Simple resumes feature great organization, sans-serif fonts and have a balanced white space with no distractions whatsoever. This is a generally recommended style for anyone applying for a senior-level or executive position. While most resumes are just a single page, an executive resume is two pages long. One page usually covers the candidate’s work history in relation to the executive position he or she is applying for. If you’re applying for an executive or senior position at an organization, be careful not to obscure professional experience with creative or elaborate formatting. Stay safe by sticking to the usual traditional resume style guidelines to show that you take the position seriously and respect the hiring company’s traditions. Creative resumes will not work for every field, but if applying for creative jobs like graphics or visual art design, the creative resume is the way to go. In other words, if your job requires creativity, showcase your talents using a creative resume. The infographic resume includes the use of visuals to give prospective employers critical information about yourself. You can use data visualization methods like graphs and charts to show your work history and skills in ways employers will remember you. Use this style if you are applying for a job with a quirky start-up or creative employer. The video resume is highly creative and should be used only when you’re a sure that it is a good fit for the job you are applying to. For example, an actor will require a reel, which is the industry requirement. If personality is a critical employment requirement (for example for a sales position), the video resume can land you that interview – overall, you’re giving employers a taste of how you’ll perform. No matter the job you’re applying to, you’ll still need a paper version of your video resume. However, the professional resume video will likely impress the creative hiring personnel. It indicates that you have taken the extra step to prove your abilities. This creative resume style can be used for applying for work in visual industries like photography and art where samples of your work are required. If applying for teaching jobs, include lesson sample plans and homework assignments in the portfolio. You can make the portfolio resume as a personal website whose link you include in your paper resume. The paper portfolio can be a daring single-page document that includes images and tests that show your past works. Or, you can create it into a full-blown portfolio with samples, achievements, and publications in a three-ring binder. Create a career portfolio that acts as a reference point whenever you are preparing for an interview or writing the all-important cover letter. Your portfolio will help you stand out from other job seekers since you have samples of your works to show. So, should you make a creative resume or stick to the traditional resume? While having a different style will definitely get you noticed, it’s important that you look at the position you are applying for while creating your resume.